I know I already mentioned the All Blacks in detail on the New Zealand Rugby Union page, but this is mainly pictures. Here are the players I'd have on my "ultimate" team. Tana Umaga's real name is Jonathon. Carlos Spencer picks his nose. Scrum trainer Richard Loe farts and talks in his sleep as well as sleepwalks. Carlos wears a nightie to bed. Doug Howlett and Dan Carter are the momma's boys. Daniel Carter is the team baby. The forwards gel their hair before a game, but not the backs. Dan Carter uses the most hair gel. Ma'a Nonu is a Mormon. Dan says if he could do anything besides rugby he would own his own business or be an underwear model. Caleb Ralph is the most social and the biggest party animal. Dan, Ma'a, and Carlos (seem to) get the most attention from the ladies. The tight 5 always smell the worst after training or a game. Ma'a is the team prankster and has prank-called the media numerous times. Dan Carter has stolen his teammates underwear. Byron thinks he is good looking but Greg prides himself on his appearance. Caleb is the tidiest in the team. Rodney and Tana are the best singers. Carlos, Dan, and Rodney are the most popular in the team. Keven's worst habit is saying "um". 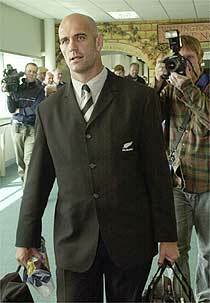 Richie McCaw has a pilot's licence, but most of the boys don't trust him to go flying with him! Ma'a and Keven are the team clowns, and Ali is a bit of a joker. Brad Thorn eats the most. "Like a horse" is how he's described. Kees Meeuws can bench 200 kilos. The field is quiet without Ali. Ben Blair can get very grumpy at trainings. The Fijian boys (esp. Joe) take the longest to get up in the mornings. Carlos is the best golfer in the team. Joe is the best swimmer in the team.